Star Trek: Asterisk "Friday's Child"
While trying to negotiate a mining treaty with a clearly underdeveloped planet, Kirk and the crew discover that the Klingons have laid claim to the planet as well. This one is a political drama for the ages almost like something out of Game of Thrones. And that would be awesome if it weren't completely against the Prime Directive. You see, it opens with Bones talking about his trip to Capella IV and how he met with the tribal natives to open negotiations for a Federation mining operation. Well, if Admiral Archer would have caught wind of this, he would have blown a gasket. 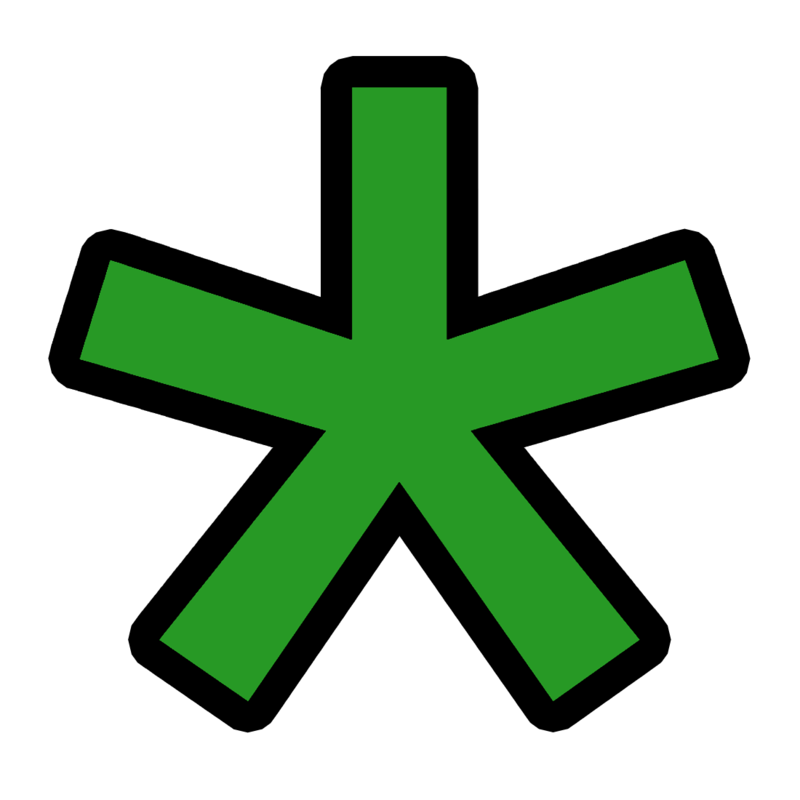 This civilization clearly has not been to the stars yet, and it's not even clear if they understand about the existence of life on other planets. The Prime Directive is, at this point, down the drain. Leaving Scotty in command of the Enterprise, Kirk, McCoy, Spock and a redshirt beam down to continue negotiations. And when they arrive, they find a Klingon in their midst. Immediately the redshirt fires at him, and immediately the natives retaliate with their boomerangish weapony type things. Now a redshirt is dead. This is not a good way to start off negotiations. Warily, Kirk decides to continue negotiations, this time with a Klingon competitor. During the course of events they discover that the tribal leader has a wife and that this wife is pregnant with the next king. Which makes things inconvenient when the next in line for the throne stages a coup and attacks everyone. During the scuffle, he kills the king and then sets out to kill the queen and her unborn child so that he can be king. And the queen seems to be ready to give up her life... but then Enterprise guys save her. Turns out this civilization is a lot more like the Klingons than they are like the Federation. That seems to give the Klingon negotiator an upper hand. So the tribe teams up with the Klingon to find Kirk, Spock, Bones and the Queen. 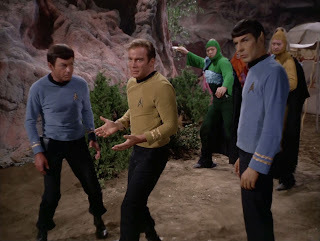 To make matters worse, a fake distress call has called Scotty away from the planet so the landing party can't beam up. Meanwhile, the Queen refuses to allow anyone to touch her except for Bones and even then, only after a good slapping contest. Caution: Slap fights may lead to derp faces. The four of them find a cave to take refuge in while the rest of the village and the Klingon come after them. 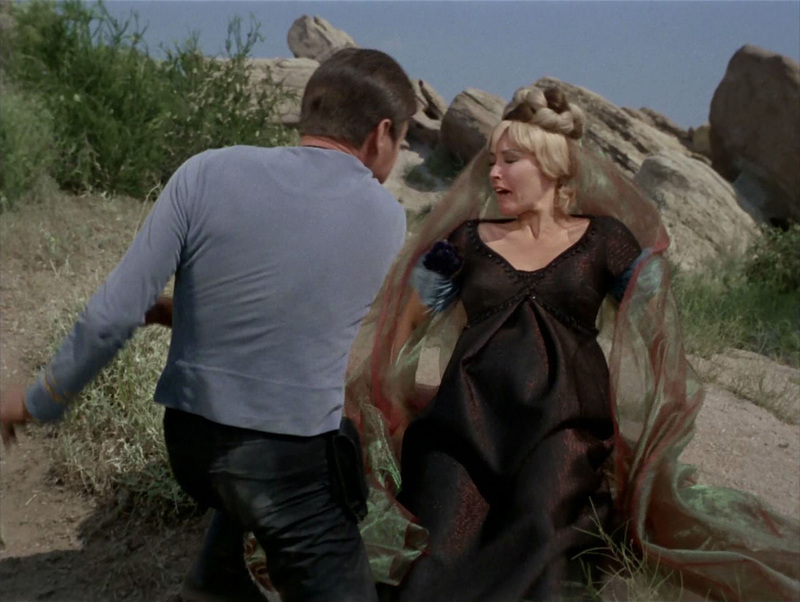 While they wait, Kirk and Spock create makeshift bows and arrows to defend themselves while Bones attends to the Queen who has gone into labor. When she finally gives birth, she hits Bones over the head with a rock and rushes out. I guess birth recovery time is a lot quicker for these aliens. The tribesmen arrive with the Klingon at the base of the ledge where the landing party is hiding. It's a standoff. Suddenly the queen arrives on the tribesmen's side and claims that the Earth men and her child are dead. The Klingon doesn't believe her, so he breaks the standoff by heading to the cave, only to be met with an arrow to the knee. Another confusing battle ensues which only ends after the Klingon is dead and Scotty's away team arrives with reinforcements after fighting off a Klingon ship in orbit. Long story short, the queen names her son, and the new king, Leonard James Akaar. And Spock observes that Kirk and Bones are going to be awfully pleased with themselves for the next week or so. but when I do, children are named after me. This episode is basically ridiculous, but I suppose it's entertaining in its own right. As a standalone episode, it works, if you can believe that a woman can recover so quickly after childbirth. But taking the rest of the franchise into consideration, there are far too many logic holes to plug. We'll put Spock to work on that right away.